Baked following a traditional recipe in the heart of the Scottish Highlands, these melt-in-the mouth all butter shortbread biscuits are made using churned British butter and British wheat flour including flour from wheat grown on Duchy Home Farm at Highgrove. 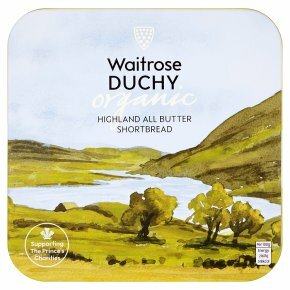 Good Causes - Sales of Waitrose Duchy Organic products provide a donation to The Prince of Wales's Charitable Foundation. This year, over £2.5m will be donated to the Foundation, supporting good causes across the UK. Since 2009, you've helped to raise over £17m for initiatives such as the Duchy Future Farming Programme, which helps farmers develop more sustainable farming practices. Baked following a traditional recipe in the heart of the Scottish Highlands, these melt-in- the-mouth all butter shortbread biscuits are made using churned British butter and British wheat flour including flour from wheat grown on Duchy Home Farm at Highgrove.